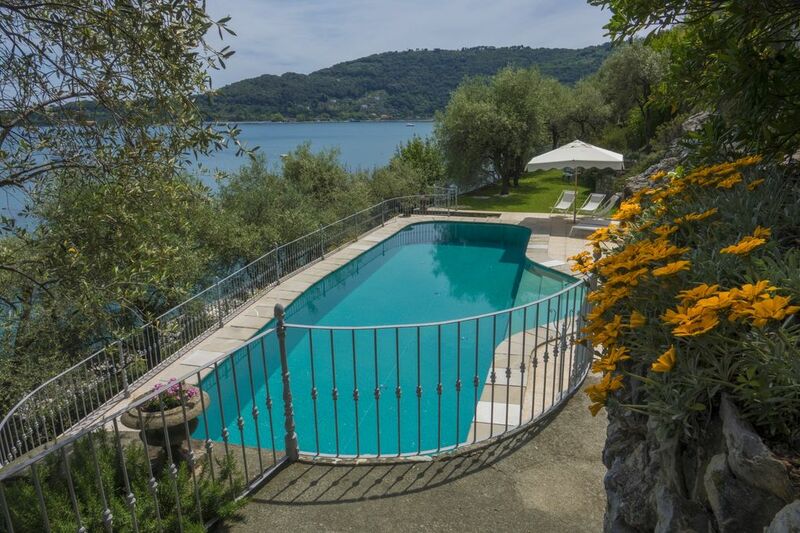 Villa Argia, exclusive and elegant family property, hosts up to 8 people; 6 in the main villa and 2 in the pool cottage. At the lower floor there are: the wide well equipped kitchen, the dining room, the drawing room and a small bathroom. A beautiful marble stair, designed by the owner, leads to the upper floor where there are 3 bedrooms; 2 with ensuite bathrooms with showers while the 3d bedroom has an adjacent bathroom with tub. A nice relaxing room is between two bedrooms. In the pool cottage the 4th bedroom with bathroom and shower. I'm Teresa, one of the two owners' wife. I look after bookings and I'm the one you'll address to for any enquiry. I give great importance to details and my aim is to keep improving. As I like traveling I try to offer guests what I'd like to find as guests when I go abroad. It will be my pleasure assisting you and I'll do my very best to help you, before, during and after your stay. I can't wait to welcoming you. The villa has been a much beloved family property since 1950. It is an evident example of the italian style. The Elegance of its interiors, the Spectacular ever changing sea view, the garden and the sea-water swimming pool make this villa really a special and a UNIQUE one. The villa is just above the sea and really close to the village this aspect will be greatly appreciated not only by parents but especially by teenagers who will enjoy reaching the village by themselves in safety and amusement. The swimming pool is at disposition only from May to end of September; in winter only 6 people, the guest cottage is not available. The best property in Portovenere! Villa Argia is a wonderful property and perfectly located. It is ideal for any family or larger group wishing to visit Cinque Terre. From Portovenere you will have easy access by ferry to most of the villages. The ferry terminal is an easy 10 minute walk from Villa Argia and you will be able to visit one, two or even three of the villages during a one day outing. Once back in Portovenere you will enjoy its numerous restaurants, town squares and medieval streets. Our group of 8 family members, age 3 to 65 spent the most memorable 5 days at the villa. The main house is a beautiful 3 bedroom /3.5 bath estate home. There is also a very comfortable one bedroom guest house closer to the pool and garden area.The property is immaculately clean and shows pride of ownership throughout. Giving its central location steps away from the beach, it is a surprisingly very private domaine. Villa Argia is surrounded by numerous terraces, an immense garden and a very large salt water pool. No matter where you are on the grounds you have beautiful views of the sea. If you are planning a visit to "Cinque Terre" and Villa Argia is within your budget and available, do not hesitate to book it. Thank you Teresa and Francesco for your prompt and professional responses to all our queries. It was a real privilege to stay at the "Pink Lady"! Thanks Pierre, all our efforts to keep at the very top level this beloved but very demanding property are largely compensated by rewies like yours. We are pleased to have contributed to have made your stay a memorable one. It was our privilege hosting you and your very attentive family. Once again thanks for having chosen Villa Argia and, of course, do come back :-). A genuine family home and "getaway" on this busy stretch of coastline with owners that really care. Thanks is not enough to express our gratitude to the owners of this traditional home that made our stay so memorable. We enjoyed a very relaxing week in part because we felt we had our own private sanctuary on what is otherwise a very busy and "touristy" part of the Italian coastline. To be able to retreat to the villa and sit in its well manicured gardens or by the pool was indeed a blessing. The kitchen is well equipped and it almost feels as if the owners vacated the day before you arrived and left the fridge and pantry well stocked with basis essentials. The milk, fruit, bread, orange juice, wine etc thoughtfully purchased for us before our arrival was a welcoming touch. The villa was very clean and neat. It was cool in the heat of the day. The owners presence to welcome you upon arrival is a nice touch and their orientation walk through plus recommendations on local restaurants and attractions greatly appreciated. They even went to the trouble of making a couple of reservations for us to ensure we were well accommodated in local eateries. We will definitely recommend this place to friends and plan to return ourselves. It is always nice to know that guests have enjoyed and above all that they have noticed and appreciated the attention we pay to mantain the “ Elderly Pink Lady” as beautiful as ever! It will be our pleasure to welcome you again, thanks for your kindness. Absolutely amazing experience! This is a true Italian Villa, meticulously and lovingly maintained with every amenity, located in Portovenere (which in our opinion was hands down the best choice we made). I'm not sure you can find a better town if you are planning day trips to Cinque Terre, Portofino, Santa Margherita and other local areas. There is so much to see. The ferry leaves from the town center and we used local taxi's for other excursions. The property takes your breath away as it's located on a hillside overlooking the sea. The property is much bigger than we expected and the kids loved walking down the stairs to the local pier to dive in the water. They also walked on their own to get food and gelato and enjoyed the freedom of the town. We felt safe and by the end felt like locals :) The town is amazing with grocery stores, an abundance of cafes, restaurants, and shops. Teresa went above and beyond to make sure our stay was incredible. The communication before and during our stay was so appreciated. She also helped us plan local day trips. It's hard to convey just how amazing this property is. The photos don't capture the magnificence of the home or the area. We were two families travelling together and we all agreed this was the most spectacular property we have ever rented in every regard. Your words and impressions are better than anything else I might write to describe the property and to encourage guests to visit us. It was a real pleasure welcoming you. We fell in love with this villa the moment that we arrived. The photos do not convey the beauty of this house or the surrounding area. It felt like home from the moment we went through the front door till the time that we left. The property is a prominent local landmark, lovingly cared for by the family who have owned it for over 60 years. The building dates to the 19th century and is surrounded on one side by a terraced olive grove. The pool is simply spectacular and will inspire envy amongst your friends when they see the pictures. It made for a truly unique and memorable vacation! Teresa was extremely helpful during the entire process, from booking inquiries to setting up local reservations. She was a very gracious host and I am thankful for all that she did to make our visit very special. The central piazza of Portovenere is about a ten minute walk from the villa. There are a number of excellent restaurants nearby, as well as amenities such as markets and pharmacies. This location is not the isolated rural villa of Tuscan fantasy, so be prepared for the reality of modern life (street noise, etc). If you are curious about the surrounding area then I would recommend using Google Earth to view it,. In short, I was very happy with my experience here and I plan on returning again. It was superb and, in my opinion, very reasonably priced for such a unique experience. 5 Stars. FABULOUS week at Villa Argia - a dream come true! We enjoyed a WONDERFUL week at this beautiful house from June 3-10. I chose this property AND the town of Portovenere based on other traveler's great reviews, so I will take the time to elaborate on our experience. 1)The property/house: amazing! The pictures don't do it justice. The main house is beautiful, colonial and renovated in the 90's. Cool marble floors, airy and light-filled bedrooms- each with their own bathroom. Also a half-bath downstairs off the living room. There are 3 bedrooms in the main house, then a 4th bedroom and bathroom with it's own little living area in the 'pool house' which is a few steps away. We were a group of 8 - two couples in their 30's and 2 couples in their 60's. Everyone was comfortable. Note: there is NO A/C which was not an issue for us at the beginning of June (highs in the mid-70's) but maybe would be later in the summer. Kitchen is very functional. The pool is incredible and the entire property has stunning views! We enjoyed prosecco on the balcony every evening. 2) Location: Portovenere is the hidden gem of this region. The scenery is breath-taking - green terraced hillsides ending into the blue mediterranean - all the beauty of Cinque terre without the crowds. It is definitely a resort town, but in a much more laid back way than the hectic little towns of Cinque Terre. On two separate days we took the boat to Cinque Terre (around 20-30 min to the first town). *Note: the boats run multiple times per day to most of the towns of Cinque Terre but DEPENDING ON THE SEAS/WEATHER, so there were a couple days that no boats were running. (don't leave a trip to Cinque Terre to the last day). The house is a 1 minute walk to the beach/oceanfront, a 2 minute walk to get coffee/gelato and a 10-12 minute easy, flat walk along the promenade to the main center of town with many wonderful restaurants. 3) Communicating with owners - 5 stars! Teresa was incredibly responsive and helpful in every way. She answered questions via email immediately, and was at the house for our arrival and departure. She also helped us arrange activities such as visiting a local wine tasting room (Ca Lunae, a must! ), and making dinner reservations. Overall, the entire week was a mediterranean dream come true- and staying in this house was the best part! FYI First week of June was great weather:) Ocean warm enough to swim. We would recommend this property to family and friends. It would also make a STUNNING small wedding venue. Hope to return! The villa is not rent in the hottest months. Furthermore, due to its location, the "elderly pink lady" is kissed by the sun until 4/5 pm and being just above the sea it benefits of a very pleseant and mild breeze at night. May all your dreams come true so.....we'll have the pleasure of welcoming you again:). The Villa is beautiful, amazing grounds, fab pool, and all overlooking the sea. Its actually closer to the town than we expected, just a short walk to restaurants and shops, everything within easy reach including boats to Cinque Terra and the islands. Our host had also left a welcome pack including fruit bowl, wine and prosecco, all of which was appreciated while relaxing in the sun by the pool! A really fabulous property, clean, well equipped, everything you need for a great holiday. We loved it! It was our pleasure to host you especially because we knew you were coming for an important occasion. We are pleased you have enjoyed it so much. The closest airports: Pisa, Genoa and Florence. Once arrived to La Spezia follow directions to Portovenere then to loc. Olivo, you have arrived! Park your car inside the property and .......hurry up go swimming, where? It is up to you! Don't hesitate adressing us for anything you may need or wish, we'll do our outmost to satisfy your requirements. Le spese di pulizia €400 da pagarsi in contanti alla consegna delle chiavi. The final cleaning €400 is to be paid by cash upon arrival. In inverno solo 6 Perone in villa, la dependance non è disponibile. In winter only 6 people in the villa, the guest cottage is not available. La piscina solo da maggio ad ottobre. Swimming pool only from May to October. Preferibilmente non fare il check-in la domenica. If possible check in not on Sunday.